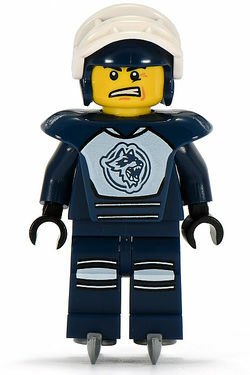 The Hockey Player is a Minifigure that was released in 2011 as part of the 8804 Minifigures Series 4. He has an earth blue colored hockey outfit with a face guard element which can attach to the helmet. His team symbol is a wolf. He includes a new white hockey stick piece, skates, and a stud as a hockey puck. He is also one of two minifigures to have the new ice skates piece, the other figure being the Ice Skater. The Hockey Player and the Bride tie for the most bricks in the set out of all the Collectable Minifigures, at ten each. The Hockey Player's, the Downhill Skier's and the Island Warrior's stats are currently the second-highest stats of all minifigures in all series. Mr. Gold has the highest stats. The Hockey Player, the Evil Knight, the Conquistador, the Football Player, the Heroic Knight, the Maraca Man, and Taco Tuesday Guy don't have torso printing. The Hockey Player's "jersey" was originally used on the Hockey figures back in 2003. Raised by wild wolves out on the frozen tundra until he was discovered by a traveling sports agent, the Hockey Player quickly proved to have a natural talent at the fierce and fast-paced sport of ice hockey. Whether he’s chasing the puck across the rink or guarding his team’s home goal, he’s dedicated to one thing and one thing alone: winning the game! No one’s faster or tougher on the ice than this ferocious fellow, and no one’s more loyal to his team, either. Rival players have learned not to get too close to the Hockey Player when he’s ‘in the zone.’ Why’s that? Let’s just say that the cage on his helmet isn’t only for his own protection! Facts about "Hockey Player (Minifigures)"